Handmade statement pieces by Ethan Allen. Ethan Allen, an American classic furniture and interiors atelier, has introduced a number of handmade statement pieces. Ethan Allen’s Art Deco Gold Starburst Mirror, a hand-antiquated and hand set mirror with a hand-rubbed gold finish, would appeal to the bohemian end-user and could be the centrepiece of any wall. For those who like a clean industrial design, there is the industrial era-styled Montrose floor lamp. “Taking inspiration from industrial studio lights, the Montrose’s brass, iron and steel body and polished nickel finish brings back the glory of industry in full swing in a tasteful package that looks exceptional in any living room,” says a spokesperson for Ethan Allen. Then there’s the Landon Ottoman, a piece that stitches together practicality with comfort. Tasteful and alluring, the ottoman can play the role of footrest, stylish coffee table or bench. Each stitch on the sumptuous leather finish is done entirely by hand, the spokesman points out. For people wanting small accessories to embellish nooks and crannies, Ethan Allen’s Light Sugarcane Trays – carved and laminated by artisans and carrying polished nickel handles – might be just the thing. “At Ethan Allen, we design and build most of what we sell, and have been doing so for decades. This lets us control the quality and craftsmanship that shapes our products, so that we can create enduring style icons,” says brand manager Leon Machenaud. Ethan Allen is known for creating masterpieces at surprising value, where each item is tucked, trimmed, upholstered and stitched by hand. 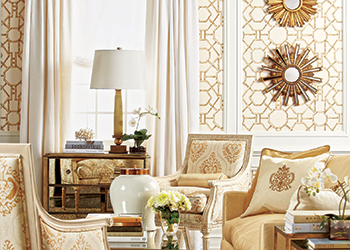 In the UAE, Ethan Allen operates under Alabbar Enterprises. 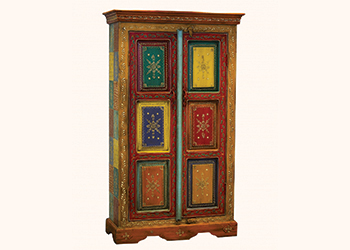 A wooden cabinet ... from United Furniture. United Furniture, a leading furniture and furnishings brand in the UAE, has introduced a collection of vintage furniture pieces into its outlets. Drawing inspiration from the trends of the past, the company is now featuring an exceptional range of fun and dynamic furniture fit for anyone who yearns to go back to the past eras, says Anup Ravindranath, director, United Furniture. “In recent years, we have noticed an ever-rising trend focusing on the revitalisation of vintage couture and interior design,” he says. “We wanted to provide our customers with the opportunity to emulate these stylings into their own homes. Our collection features an extensive range of varying vintage looks that will, undoubtedly, appeal to any lover of conceptual furnishing,” he adds. United Furniture has been transforming home and office furnishings since 1975 through its striking designs and décor solutions. The brand is known for its contemporary and classic collections, meeting the styles of the modern-day home décor. The company sources contemporary collections from across the globe guaranteeing the highest quality and world-class style, according to Ravindranath. The brand also houses a vast collection of furnishings and accessories. United Furniture’s showrooms in the UAE are located in Dubai and Sharjah. Coast to Coast ... an airy look. 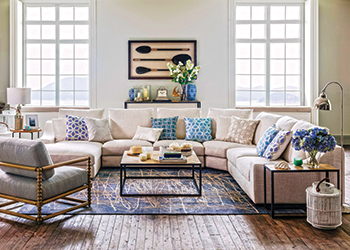 Indigo Living has launched its spring/summer 2016 collections offering a wealth of inspiration for all kinds of interiors. This season’s five main trends comprise Riviera Retreat, Town and Country, Understated Elegance, Coast to Coast, and Northern Light. Riviera Retreat is a light but glamorous look that combines classic design elements with contemporary appeal. Taupe, dove grey and white provide a neutral canvas to which are added interesting pops of colour including coral, pistachio and midnight blue. These make a statement when used in major pieces such as a bed or coffee table but can be equally effective incorporated into smaller details like cushions or a vase. If one prefers a more homely style, Town and Country offers a slice of easy living. Overstuffed sofas, mix-and-match accessories and family treasures are put together to offer a wide-ranging palette of bold colours paired with pieces of furniture to give a look that is fun and stylish. Understated Elegance encapsulates a more polished urban lifestyle. Its sophisticated colour palette revolves around different shades of grey, giving it a slightly more masculine feel. The quintessential summer trend has to be Coast to Coast – a calm and airy look that is reminiscent of sophisticated beachside homes. Finally, Northern Light is a Scandinavian-inspired trend that works wonders with neutrals to give a look that is young, hip and fresh.